Imagine a future where you didn’t have to apply makeup directly to your face. Rather, you would wear a tiny projector that would map the contours and movements of your face. This little projector would splash your face with whatever face you want to present to the world. 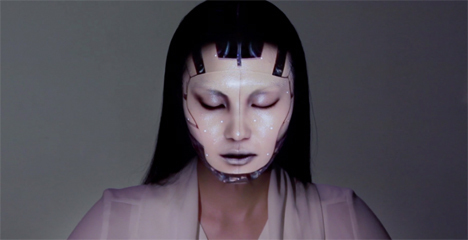 With that mapping data, a projector uses specific points to project images onto the face. The images follow the face perfectly as it moves, providing a real-time mask that can be nearly anything you want it to be. OMOTE is a proof of concept at this point, but the possibilities are scintillating. Real-time 3D mapping and facial projection could make for some killer Halloween costumes and, if the projectors could be made small and nimble enough, even stage makeup. Unfortunately, the team hasn’t provided many technical details about how the effect is created or even what type of hardware is used, so it isn’t clear just how much the technology could accomplish.